A black woman says she had the police called on her by a female while she was sheltering from a thunderstorm in the doorway of a Brooklyn apartment building. 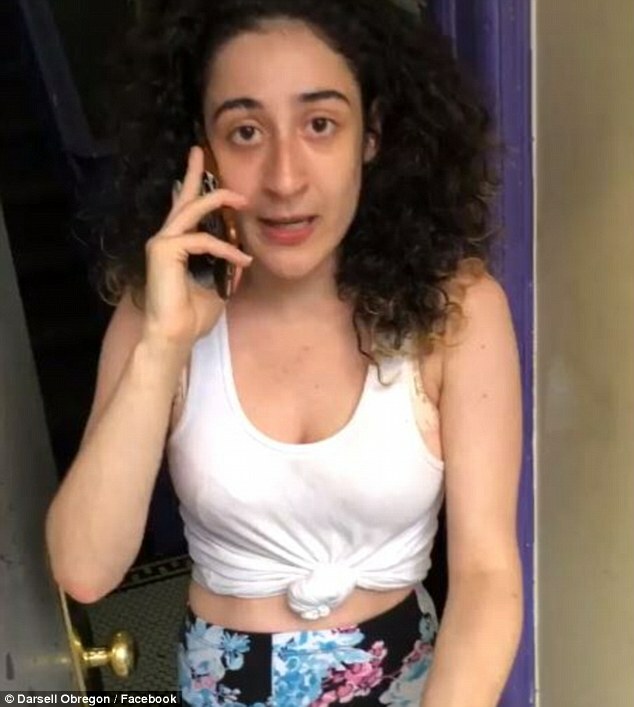 Darsell Obregon filmed her encounter with the woman in the wealthy Park Slope neighborhood and posted the footage on Facebook last week. Obregon said she was on her way to a subway station when the rain started and sought cover in a small space outside the apartment building while she called an Uber. She claims the woman, identified as Arabella Juniper Torres, came out of the building and demanded that she leave. 'No more than three minutes later a young woman who lives in the building opened the front door and told me that I can not stand there and had to leave,' Obregon wrote on the Facebook post with the hashtag #whiteprivilege. Obregon filmed a barefoot Torres as she spoke on the phone with police. 'Ma'am this is not public property,' Torres told the dispatcher. In a separate video after Obregon's Uber arrived, she filmed Torres trying to stop the driver from leaving. She then proceeded to give the 911 dispatcher the Uber driver's license plate details. It is the latest in a long string of incidents that have gone viral on social media after white people have called police to report black children and families doing seemingly every day tasks. A woman, dubbed BBQ Becky, called police on a black family in May as they were barbecuing at a park in Oakland, California for not using the right kind of grill. Alison Ettel, the CEO of a San Francisco marijuana firm who was branded Permit Patty, was forced to step down following backlash after she reported an eight-year-old black girl to the police for selling water.